Kamalu J. Beamer, MSFS, is currently part of Narcotics Enforcement Division Forensic Laboratory team of the Hawai’i State’s Department of Public Safety. Mr. Beamer earned his undergraduate B.S. Physics at University of Hawai’i at Manoa (UHM) in 2013. During the same year he obtained his certificate in Hawaiian Language at University of Hawai’i at Manoa. Then, in 2016 he earned his Master of Science in Forensic Science at Chaminade University of Honolulu, Hawai’i. Mr. Beamer has been the recipient of important distinctions such as being named a UHM Physics Department Representative and UHM Hawaiian Language Department Representative, both in 2012. 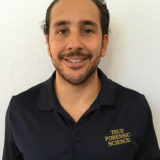 During his career he has received training in different areas of Forensic Science between which it can be highlighted Forensic Chemistry, Forensic Biology, Criminal Evidence, Constitutional Law, Fingerprints, Crime Scene Investigation, Bloodstain Patterns, and Crime Scene Reconstruction, among others. Throughout his career Mr. Beamer has occupied various positions, such as Tutor for undergraduate science and math students at The College of Natural Sciences Learning Emporium, Intern at Narcotic Enforcement Division Forensic Laboratory, and Scientific Instrument Technician at the University of Hawai’i at Manoa High Energy Physics Group Lab. This last performance took him to Japan in 2015 to collaborate with international groups at the KEK government facilities. Additionally to his several trainings and his working experience, Mr. Beamer has also being invited to Professional Presentations, between which it can be remarked a Presentation to Director of Hawaii Department of Pubic Safety in 2016 and a Presentation at a Graduate Seminar at Chaminade University of Honolulu in 2017.